Definition: A stroke is a “brain attack” and it happens when the blood supply to part of our brain is cut off. When this happens, brain cells are deprived of oxygen and begin to die. When brain cells die during a stroke, abilities controlled by that area of the brain such as memory and muscle control are lost. Signs and symptoms of a stroke may include an inability to move or feel on one side of the body, problems understanding or speaking, dizziness, or loss of vision to one side. Signs and symptoms often appear soon after the stroke has occurred. The symptoms of a stroke can be permanent. Long-term complications may include pneumonia or loss of bladder control. Other strokes are caused by bleeding into brain tissue when a blood vessel bursts (hemorrhagic stroke). Because stroke occurs rapidly and requires immediate treatment, stroke is also called a brain attack. When the symptoms of a stroke last only a short time (less than an hour), this is called a transient ischemic attack (TIA) or mini-stroke. A stroke can affect the way our body works as well as how we think, feel and communicate. The main risk factor for stroke is high blood pressure. Other risk factors include tobacco smoking, obesity, high blood cholesterol, diabetes mellitus, a previous TIA, and atrial fibrillation. An ischemic stroke is typically caused by blockage of a blood vessel, though there are also less common causes. A hemorrhagic stroke is caused by either bleeding directly into the brain or into the space between the brain’s membranes. The effects of a stroke depend on which part of the brain is injured, and how severely it is injured. Since different parts of the brain control different areas and functions, it is usually the area immediately surrounding the stroke that is affected. Sometimes people with stroke have a headache, but stroke can also be completely painless. It is very important to recognize the warning signs of stroke and to get immediate medical attention if they occur. Diagnosis is typically based on a physical exam and supported by medical imaging such as a CT scan or MRI scan. Other tests such as an electrocardiogram (ECG) and blood tests are done to determine risk factors and rule out other possible causes. Low blood sugar may cause similar symptoms. 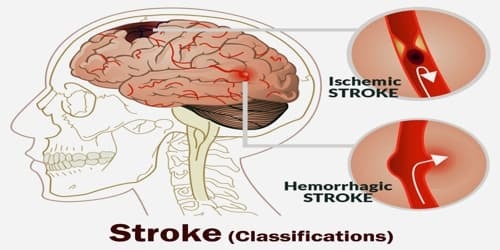 Classification of Stroke: Strokes can be classified into two major categories: ischemic and hemorrhagic. Most strokes are caused by a blockage cutting off the blood supply to the brain. This is an ischaemic stroke. However, strokes can also be caused by a bleeding in or around the brain. This is a hemorrhagic stroke. A transient ischaemic attack or TIA is also known as a mini-stroke. It is the same as a stroke, except that the symptoms only last for a short amount of time. This is because the blockage that stops the blood getting to our brain is temporary. About 87% of strokes are ischemic, the rest being hemorrhagic. Bleeding can develop inside areas of ischemia, a condition known as “hemorrhagic transformation.” It is unknown how many hemorrhagic strokes actually start as ischemic strokes. 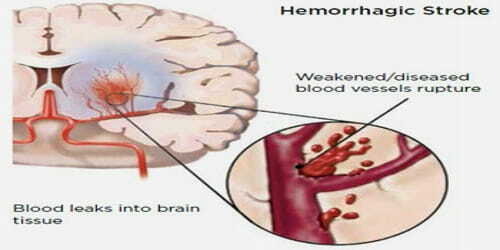 Hemorrhagic Stroke: Hemorrhagic strokes are less common, in fact only 15 percent of all strokes are hemorrhagic, but they are responsible for about 40 percent of all stroke deaths. Intracerebral hemorrhage, which is basically bleeding within the brain itself (when an artery in the brain bursts, flooding the surrounding tissue with blood), due to either intraparenchymal hemorrhage (bleeding within the brain tissue) or intraventricular hemorrhage (bleeding within the brain’s ventricular system). Subarachnoid hemorrhage, which is basically bleeding that, occurs outside of the brain tissue but still within the skull, and precisely between the arachnoid mater and pia mater (the delicate innermost layer of the three layers of the meninges that surround the brain). 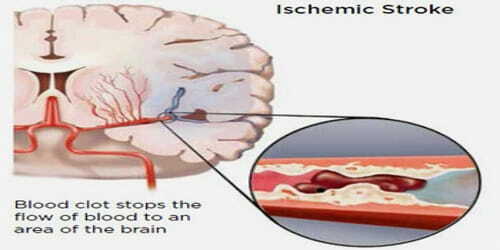 Ischemic Stroke: Most strokes are caused by a blockage cutting off the blood supply to the brain. This is called an ischaemic stroke. A blockage can be caused by a blood clot forming in an artery leading to the brain or within one of the small vessels deep inside the brain. This is called cerebral thrombosis. Blockages in the brain can also be caused by a blood clot or other matter (such as an air bubble) moving through the bloodstream from another part of the body. This is called a cerebral embolism. Ischemic strokes account for about 87% of all strokes. High blood pressure is the most important risk factor for this type of stroke.